Officially, the Mars bar with cereal is one of the best things I’ve ever eaten. The basis of this bar is nothing but a bar of the well known chocolate, Mars. The whole thing is fabulously simple to make. Ingredients you need for making corn and Mars bars. In addition: baking paper and cake mold. 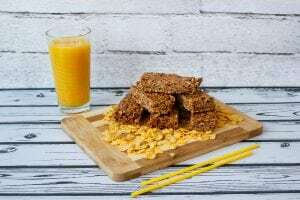 How to prepare corn flakes bars. Put butter and maple syrup in a pot. Dissolve on low heat while stirring. When dissolved, add the chocolate bars cut into small pieces. Stir until the bars completely melt and create a homogeneous mass with the butter and syrup. Remove the pot from the fire. Add the cornflakes to the mass. Mix very gently. Grease the cake mold with butter or margarine then line it with baking paper. Put the mixture into the mold, spread evenly gently pressing on the top with a metal spoon. Cool for at least one hour in the fridge. After taking it out, cut it into pieces of a size according to your taste. What you need to know when making Mars bars. The form I used had a size of 21 by 31 centimetres and was rectangular. Do You like bars? 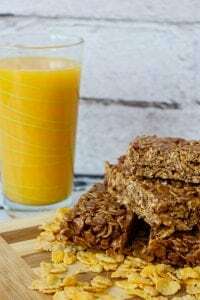 If yes, then try our recipe for Healthy oat bars with bananas.